Or view larger version. National Guard troops on the University of California, Berkeley campus. May 19, 1969. Lonnie Wilson, photographer. Gelatin silver print. Collection of the Oakland Museum of California. The Oakland Tribune Collection. Gift of ANG Newspapers. 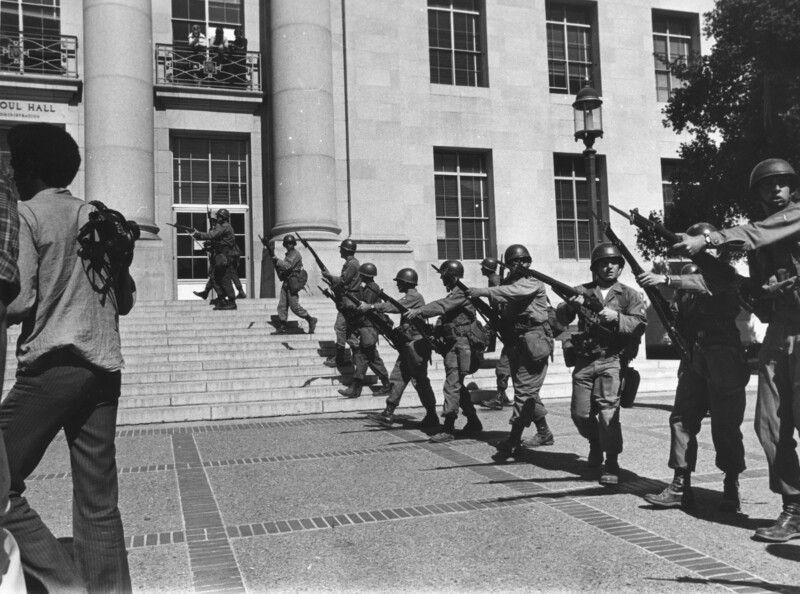 This photograph shows a dozen National Guard troops walking with bayonets fixed, in front of the Sproul Administration building on the University of California, Berkeley campus several days after “Bloody Thursday.” Bloody Thursday was the culmination of the conflict between the residents of Berkeley, the University of California and the state government of California regarding a piece of land owned by the University that became known as People’s Park.